Owning dividend stocks into retirement can let you grow your income without lifting a finger. If you aren't aware of how powerful dividends are for investors, you're missing out on potentially the biggest opportunity we have to build long-term wealth. Not only do dividend stocks outperform their non-dividend-paying rivals over time, but they'll pay you for doing absolutely nothing. And if you pick the right dividends, they'll pay you for decades. Here are three you can count on long into retirement. Downy is just one of many common consumer brands under the P&G umbrella. A $10,000 investment in 3M (NYSE:MMM) made at the beginning of 1970 would have paid you $4,991.79 in dividends this year alone -- and that figure continues to grow. A $10,000 investment in Procter & Gamble (NYSE:PG) in 1970 would pay you $14,978.33 based on the most recent dividend, which is also growing. Meanwhile, Colgate-Palmolive (NYSE:CL) traded at an adjusted cost of $1.25 per share in the beginning of 1972, and a $10,000 investment made then would pay you $11,520 this year. These three companies are among the best of what we call dividend aristocrats -- that is, companies that have raised their dividends for at least 25 consecutive years. 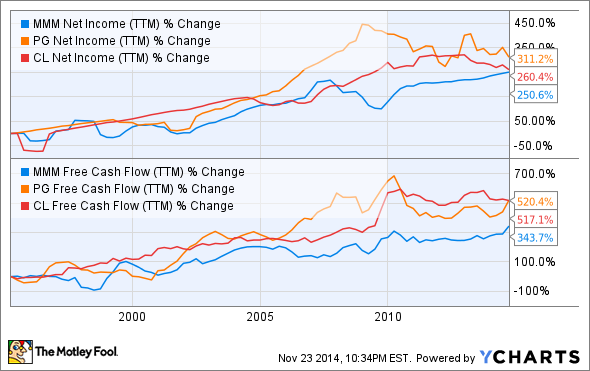 What separates these three companies from the rest is their average of 114 years of paying a dividend. More than likely, you could buy these stocks and count on getting a dividend every year for the rest of your life. Not all dividends are created equal, and the century-long duration of dividends from 3M, Procter & Gamble, and Colgate is noteworthy in itself. But it's the businesses behind these dividends that make their stocks worth owning forever. Scotch Tape might not be a growth product but it's a staple in the 3M lineup. Image owned by TMF. 3M has its hands in almost every industry, from energy to consumer goods to automobiles. This diversity gives the company stability, and its focus on research and development ensures that it will remain one step ahead of competitors as new products come out. Procter & Gamble makes some of the most iconic consumer brands in the world. Charmin, Bounty, Tide, and Crest are just a few of the brands under its umbrella, and they have proven their staying power over decades. What's incredible about these brands is that they're growing in emerging markets, which are just starting to use consumable goods the way we do in the U.S., expanding the company's addressable market. With so much shelf space in the world's retail stores, this is a rock-solid business. Colgate-Palmolive is known for toothpaste, and that's a huge part of its business, but it also makes Speed Stick, Irish Spring, and Palmolive in personal and home care. If personal hygiene goes out of style, Colgate-Palmolive's business may be in trouble, but I'm willing to bet that we'll still be using toothpaste, diapers, and deodorant in 100 years, and Colgate-Palmolive will play a big part in providing those products. To pay investors a dividend year after year, companies need to make consistent profits and have large amounts of free cash flow. On that front, these three companies are a cut above the competition. You can see below that over the past 20 years, 3M, P&G, and Colgate-Palmolive have all more than tripled their net income and more than quadrupled free cash flow. Remember that this is on top of using some of their cash to pay dividends. The focus on maintaining and growing dividends forces management to make decisions that will lead to long-term cash flow growth. This can keep them from making common corporate mistakes like empire building -- i.e., making large acquisitions to increase the size of their company -- or betting on high-risk growth projects. Slow and steady wins the race when it comes to dividends, and I'm betting these three stocks will be paying you long after you retire, no matter how young you are. That's the kind of investment I can sleep well at night owning.